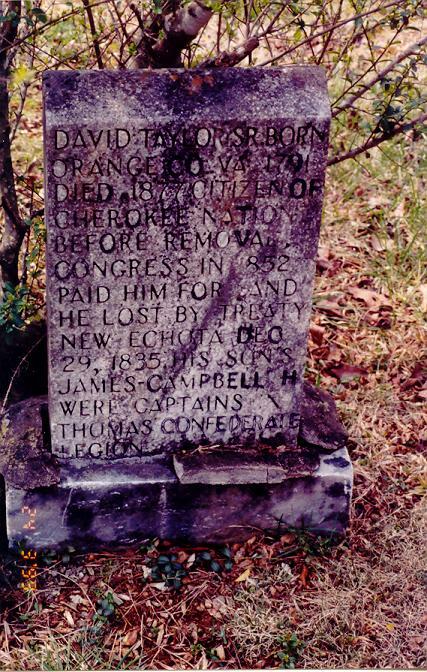 James* and Campbell** H. Taylor served in Company B, Infantry Regiment, Thomas' Legion. 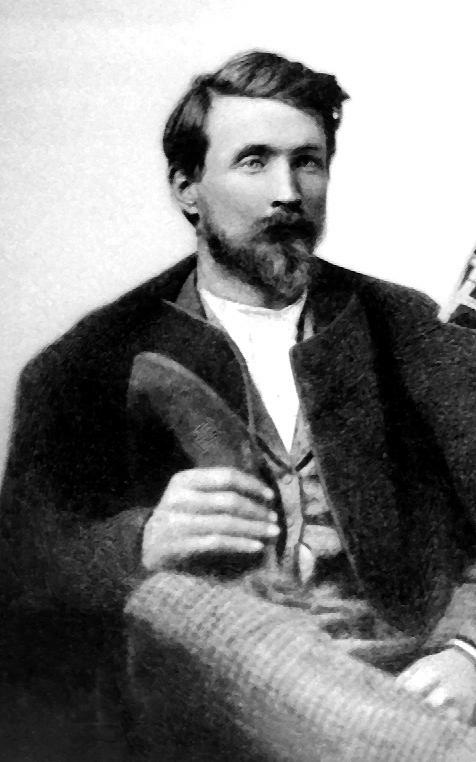 On May 18, 1862, Colonel Thomas split his Indian company into two groups. James Taylor commanded the original unit, and Gideon M. Hanks was elected captain of the second. When Hanks was killed in 1863, James Taylor was promoted to captain. Prior to the reorganization in 1863 it was known as Company D. Campbell H. Taylor was personally recommended for his gallantry to General Braxton Bragg during the Skirmish in Cherokee County North Carolina - October 27-28, 1863, with Captain Goldman Bryson. It was rare to be recommended by name to one of the eight generals in the Confederate States Army, and Lt. Campbell H. Taylor received that honor when he was commended to General Braxton Bragg. There were four general grades in the Confederate States Army: brigadier-general, major-general, lieutenant-general, and general being the highest attainable rank. However, during informal communication each may be addressed as general. *Captain James Taylor enlisted on April 9, 1862; residence Murphy, Cherokee County, North Carolina; commissioned 1st Lt. May 18, 1862; commissioned captain November 1862, according to Lt. Colonel William Stringfield in Walter Clark's, North Carolina Regiments 1861-1865, Volume III, p. 730. However, Vernon H. Crow, Storm in the Mountains, pp. 161 and 259, states James was most likely promoted to captain (1863?). Vernon's reason is that Hanks commanded the company until the summer of 1863. **First Lieutenant Campbell H. Taylor enlisted on April 9, 1862; residence Murphy, Cherokee County, North Carolina; commissioned 2nd Lt. on September 10, 1862. 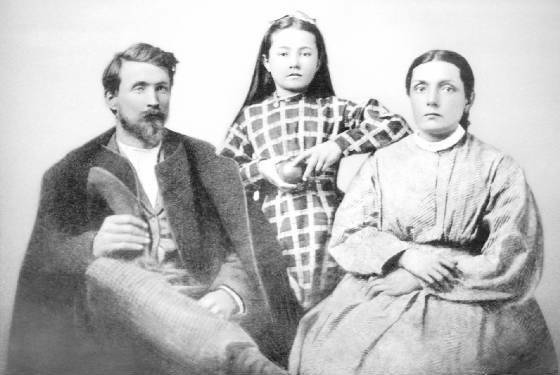 Seated from left to right are Campbell "Cam" Harrison Taylor and first wife Stacy E. (Welch) Taylor. Standing between them is their oldest child, Elizabeth "Bettie" Haseltine (Taylor) Keys. Many thanks to Keith Lowrey of Glen Allan, VA, for the photo of Cam and Stacy (Welch) Taylor and data on his ancestor, Campbell Harrison Taylor! Keith said, "The photo was taken from the tintype and touched up. The tintype has quite a few smudges that were removed and I think it came out pretty well." "Mrs. Campbell Taylor passed away at her home, near Coffeyville. Just a few days after her daughter, Polly, was killed. The shock of the death didn't help." "Campbell H. Taylor, a Pioneer Indain [sic] Lawyer of this city, died at his home, 504 East Fourth Street, this afternoon shortly before 3 O'clock. He had been in poor health foe [sic] some time and had not been in the active practice of law for a number of years. He was the father of Mrs. Shelly Keys." Coffeyville is located on the Kansas Oklahoma line and about 70 miles north of Tulsa and 70 miles west of Joplin, Missouri. Many Western North Carolinians relocated to northeast Oklahoma and northwest Arkansas areas after the Civil War and resided among the Cherokee, many of which had relocated to this area from the North Carolina mountains during the 1838 Trail of Tears. Being far removed from any semblance of the defeated Confederacy, being in or near the Ozarks was a pleasant place to reestablish the homestead. This settlement was founded in 1869 as an Indian trading post by Col. James A. Coffey, serving the population across the border in what was then the Indian Territory, commonly abbreviated as IT. The town began to flourish in 1871 when it was chosen as a stop on the Leavenworth, Lawrence & Galveston Railroad, which connected it to other markets and developments. The town was a quiet whistle stop, but it changed abruptly on October 5, 1892, when four members of the Dalton Gang were killed in a shootout during a botched bank robbery. James and Campbell were my uncles, brothers to my great great grandmother Elizabeth Taylor Whitaker (wife of Captain Stephen Whitaker). David Taylor, Sr. (not to be confused with son David Taylor, Jr.) was married to Mary Ann(a) Bigby/daughter of Catherine Foreman and James Bigby. Some bushwhackers were highly organized guerrilla units while others were just a motley group of deserters and outliers bound by the bonds of disenchantment, and since most were residents of the region prior to the war, they were familiar with the terrain and knew how to use it to their advantage. Old and new scores alike were being settled under the guise of bushwhacking, and as a general rule these men murdered and robbed merely for personal gain. In this work, Trotter conveys lively histories and exciting prose as we delve into the bushwhackers who roamed and sought out prey in the mountains during the Civil War. The study could have also been titled murder and mayhem in the mountains, as Trotter sheds light on the bloodletting groups of the well-known and otherwise lesser known bushwhackers and the hell they unleashed during the four year conflict. This book is also a great source for tracing ancestors during of the era, and it is recommended for Civil War buffs, lovers of Southern Appalachia, American history, and students of tactics and warfare. Recommended Reading: Complete Idiot's Guide to Genealogy, 2nd Edition. Description: A very helpful genealogy reference! It is extremely helpful if you're in the "I want to trace my roots, ancestors, family tree and heritage. How do I begin, where do I start, and how do I go about doing it?" situation. It contains numerous helpful common sense tips that will prevent future headaches and a lot of well thought out suggestions and tips too. One helpful hint: "Talk with your extended family and interview them for genealogy information, be patient with them, and let them tell their stories....document everything." There are plenty of well-mannered tips like these that elevate this book to excellence. A lot of the confusing aspects of genealogical research such as document requests and providing proof and evidence are well covered. Continued below.